U.S. 19, a major highway connecting Bradenton, Florida, with Erie, Pennsylvania, passes through the heart of Georgia. It overlays all of Georgia 3 south of Atlanta, and a combination of Georgia 400, 9 and 11 north of Atlanta. Georgia 300 (Florida-Georgia Parkway) also accompanies the highway from the Sunshine State north to Albany. U.S. 19 enters the Peach State 12 miles south of Thomasville. The US highway travels around the east side of the Thomas County seat, overlapping with U.S. 84 for 2.8 miles north from Smith Street (U.S. 84 Business) to the Thomasville Bypass taking U.S. 84 west toward Bainbridge. Actions approved by AASHTO on June 26, 1985 relocated U.S. 84 was relocated around Thomasville, established U.S. 84 Business through the city and eliminated U.S. 19 Business. Traveling north from Thomasville, U.S. 19 follows a four lane highway to Ochlocknee, Pelham, Camilia and Baconton. Bypassing Albany to the east, U.S. 19 splits with SR 300 north to Cordele and overlaps with U.S. 82 west from Sylvester along the Liberty Expressway. The limited access bypass of Albany was originally designated as SR 333. It became a part of U.S. 19 in 1977, with the former route to Downtown recognized as U.S. 19 Business. AASHTO granted permission to the state for the route changes on July 6, 1977. Beyond Albany, U.S. 19 heads to Leesburg and a controlled access bypass around the west side of the city. The route serves Smithville, Americus, Ellaville, Butler, Thomaston and Zebulon before combining with U.S. 41 north from Griffin into the Atlanta metropolitan area. Following completion of the freeway bypass to the west of Griffin, and as approved by AASHTO on June 23, 1969, the former routes of U.S. 19 and 41 to Downtown were redesignated as U.S. 19 Business and U.S. 41 Business respectively. 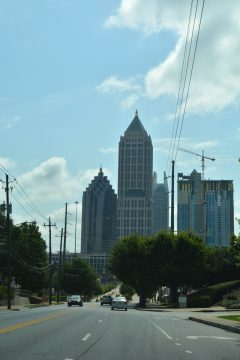 Within Atlanta, U.S. 19 navigates along a number of urban arterials and boulevard including Dixie Highway, Metropolitan Parkway, Northside Drive, Peachtree Road and Roswell Road before combining with Georgia 400 (Turner McDonald Parkway) north from Sandy Springs. The North Fulton Expressway (U.S. 19 & Georgia 400) extends from the Atlanta area north to Coal Mountain as a full freeway. U.S. 19 continues from there along an at-grade expressway to Georgia 60 and 115 (Long Branch Road). Georgia 9 follows the pre-freeway route of U.S. 19 through Roswell and Alpharetta to the west. The realignment of U.S. 19 onto I-285 east from Roswell Road and the North Fulton Expressway was approved by AASHTO on November 14, 1980. U.S. 19 and Georgia 9 north reduce to two lanes as they wind northward from the expressway end at Georgia 60 to Dahlonega. The US highway bypasses the east side of the city, with U.S. 19 Business overlaying the old route to the University of North Georgia and Downtown. The relocation of U.S. 19 around Dahlonega and establishment of U.S. 19 Business were approved by AASHTO on June 4, 1990. Continuing north, U.S. 19 passes near the highest point in Georgia (Brasstown Bald, elevation 4,784 feet). U.S. 129 combines with the northernmost 31.7 miles to Blairsville and the North Carolina state line near Ivylog. The two routes, and U.S. 76 were relocated onto a new at-grade bypass of Blairsville per AASHTO on November 14, 1980. U.S. 19 (14th Street NW) immediately intersects Hemphill Avenue as it branches southeast from U.S. 41 (Northside Drive NW). Photo taken 07/02/17. A set of HAWK signals are located between Snyder and Tumlin Streets along U.S. 19 & SR 9 (14th Street NW). Photo taken 07/02/17. U.S. 19 & SR 9 (14th Street NW) north at Spring Street. Photo taken 07/02/17. Approaching Techwood Drive, a southbound frontage street for the Downtown Connector between 16th Street NW and 10th Street SW at Georgia Tech University. An on-ramp leads onto I-75 & 85 south from Techwood Drive nearby. Photos taken 07/02/17. U.S. 19 & SR 9 span Interstates 75 & 85 (Downtown Connector) east to Williams Street. Williams Street parallels the freeway north to the 17th Street Bridge and an on-ramp linking directly with I-75 north at the Brookwood Interchange. Photos taken 07/02/17. U.S. 19 & SR 9 partition into a one-way couplet at Spring Street, which carries the southbound direction of the route from Peachtree Street NW. Photo taken 07/02/17. U.S. 19 & SR 9 north make an unmarked turn onto Peachtree Street NW. Photo taken 07/02/17. Peachtree Street NW flows north with five lanes. US. 19 intersects 16th Street NW next. Photo taken 07/02/17. NW 17th Street winds west from Peachtree Street NW and spans Interstates 75 and 85 at the Brookwood Interchange ahead of Atlantic Station. Photo taken 07/02/17. Peachtree Street NW merges with Peachtree Street NE next to a two-lane ramp connecting with SR 13 (Buford Spring Connector). SR 13 begins and circles west and then north, running directly along side Interstate 85 to Buford Highway below the exchange joining I-85 and SR 400. Photo taken 07/02/17. This shield assembly preceded the second on-ramp from U.S. 19 (Peachtree Street NW) to SR 13 (Buford Spring Connector). It was removed by 2007. Photo taken 08/22/03. The couplet of U.S. 19 & SR 9 along Spring Street south and Peachtree Street north concludes at 14th Street NW. The US route shifts west one mile to U.S. 41 (Northside Drive). Photo taken 01/17/04. Ramps connect 14th Street NW with I-75 leading north from the Brookwood Interchange and the Downtown Connector (I-75 & 85) south one block west of Spring Street. Photo taken 01/17/04. Spring Street continues south from the turn of U.S. 19 & SR 9 west onto 14th Street to Centennial Olympic Park in Downtown Atlanta. Photo taken 01/17/04.